Madrid, the capital city of Spain. Madrid, the biggest city of Spain. Madrid, a cosmopolitan modern city. Normally, we tried to avoid big cities. It feels a bit intimidating, hasty and unfriendly. But we were glad when we included Madrid in our itinerary during our first round of camper adventure in the South. We came there not knowing what to expect; and we left the city with a different insight or look about it, in a positive way. It was gloomy Saturday morning of Nov. 30, 2014 when Hans and I left Burgos. It was a 268 kms drive to Madrid; we left Burgos at 9:30 and arrived at our campsite at 12.30. 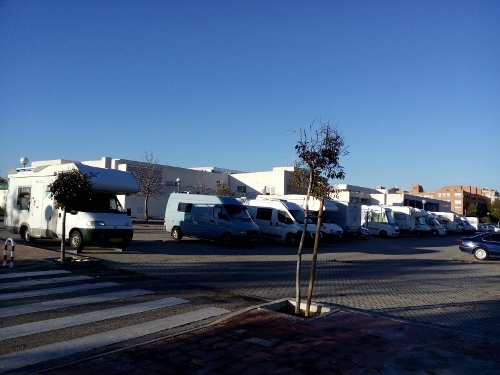 Our campsite in Madrid is a mix-parking by MS Ziekenhuis in Valdebernardo, opposite of which stands the Centro Commercial Valdebernardo. Metro station is just 300 meters away. We bought a ticket good for 10 short trips for 12 euros. We immensely enjoyed our visit in Madrid, so much that we extended our stay for one more day. Madrid is a beautiful city, with lots of sights and lights. Because of limited time , we were not able to cover or see all the attractions; but what we have experienced have lingered in our memories and will be forever with us. Below is the list of what we have done and seen during our five- day stay in the city (November 30-Dec. 4, 2014.). The building of this cathedral was built in the late 19th century and was finished in 1993; it was that year that Pope John Paul II consecrated it. A big statue of the Pope is found at the entrance lawn of the cathedral and a relic inside. There is a museum and one can have access to the dome usig the ticket from the museum. It is such an very impressive cathedral, inside and out. The ceilings are beautifully painted; there is a separate room for prayers, and a consecration altar for the Virgen dela Almudena, the Patroness of Madrid. The city of Madrid boasts of having a number of parks and gardens where people can escape from the hustles of city life. One of these parks is the Parque de El Retiro. This park is considered the most important historical-artistic park and one of the most beautiful green urban spaces in the world, according the Madrid brochure. The park has some interesting features such as the pond, where one can rent a boat for rowing in the pond, monument to Alfonso XII, the Crystal palace, and the fountain of the fallen angel. It is an ideal place for stroll, biking, jogging, or meditating. The park is also teeming with vendors that sell bags, sunglasses, jewelries and other things. Police make a regular round around the park that gives safe feeling to the parkgoers. Borrowing the words at the Madrid pamphlet, The Thyssen-Bornemisza Museum offers a journey throught he last seven centuries of European Art, from the early 13th to the late 20th century. Just like I have earlier written, Hans and I are not museum-type people. Normal price is 10 euro pp, but I read in the brochure that this museum is free of charge every Monday from 12.00-16.00, so we thought , why not? I would say, it is a pretty impressive museum with lots of nice works of arts, from portraits, to landscapes, to abstract, to still paintings. I am that much of an art aficionado, bit I was pretty impressed with what I saw. We have seen Madrid, or a part of it at day time. How about at night time? Madrid changes magically at night. Streets becomes busier than normal, buildings are lighted up, bars, restaurants and shopping centers become livelier, and the boulevards are decorated with different designs of lightworks! It was such a feast to the eyes. I couldn’t help but press my camera to picture this loveliness. Hans and I walked the whole Calle Alcala, starting from Puerta del Sol and ending at Puerta de la Alcala. Along the way, we saw some very nice and gigantic buildings like the Circulo Bellas Artes, Casino, Metropolis, Bank of Spain, Plaza de Cibeles, Palacio de Cibeles CentroCentro with its nice fountain, and the Plaza de Independencia. They all give a different image during the night when all the lights are lighted up. Also the Plaza Mayor, with its Christmas market, was busier than during the day. Puerta del Sol was a hub of activities, from street artists and magicians, to musicians and living statues and people selling lottery tickets. The Tour Bernabeu costs 19 euro pp, a bit pricey for us, but what the hell! We got in, the begins on top, with a panoramic view of the whole stadium so that the visitors will have an idea how big the stadium is and how it feels to be on top of it all. After that, there is route that visitors follow, which includes access to the trophy room, the museum, the press room and the bench players. Unfortunately, when we were there, the dressing room and the dug out were not open for public because it turned out that Real Madrid had to play that evening and the 2 areas were reserved. Palacio Real de Madrid is Spain’s Royal palace, equivalent to Holland’s Paleis Noordeinde. It is still functional and important state functions are being held here. The palace is open for public, entry is 10 euro and people over the 65 years have 5 euro discount. BUT from Monday to Thursday , between 16.00-120.00 ( until 18.00 during winter months) s the entrance free for EU and Latin American citizens. Knowing this, Hans and I visited the palace on Tuesday afternoon. We planned our day in a way that we are in the vicinity of the palace around that time. Half an hour before 16.00, a lot of people were already standing on line for the gate. There was really a long queue at that time! One word is enough to describe the palace : MAGNIFICENT!!! I’ve seen many palaces and castles inside and out, but for me Palacio Real de Madrid is by far on top of the list. More beautiful and impressive than Paleis Het Loo in Holland or Chateau de Versailles in Paris. I was really speechless during my tour of this palace. Every room is different; each room is more splendid than the other. The decorations are super and majestuous! Very beautiful and artistic frescoes and splendid tapestries decorated the ceilings and walls. Marble tiles covered the floors, some with carpets. Big and majestic chandeliers hang on every room. The decorations such as vases, clocks and furnitures are beyond descriptions. The Royal chapel is small but majestically decorated. What is more impressive and special about this palace is the opportunity it gives to the people to be close to all what royalty is. We had the chance to see the waiting room where dignitaries or special visitors wait for their audience from the King and Queen; we saw the Throne Room, where royal audience is normally given, and what a room!!!! Also more impressive is the Gala dining room where a very long table is found elegantly set for dinner! And most important is the antechamber where a collection of 4 Stravadari violins are on displayed, and adjacent to it is the Crown room where the Speech of King Felipe and the signed abdication of the throne by King Juan Carlos were displayed and the Royal Crown and Scepter are also displayed on the center! No picture taking inside the palace. Museu del Jamons is not actually a museum. It is a combination of bar, restaurant and a shop where they sell different kinds of Jamon. This establishment has different branches scattered around Madrid , but the busiest and most lively is the one in Calle Mayor. They offer different sorts of plate dishes at low prices, bocadillos, tapas and drinks. Normal glass of beer or cola is 70 cents and when you order at the bar you get also a raccion or portion of aperitif such as pieces of sliced sausages, small plate of paella or bollos (small round bread with ham or cheese). Prices of food and drinks differ when you eat at the bar or in the salon. It is always coming and going here, the ambiance is good, busy but good. And the waiters are gladly enjoying their works, not forgetting who ordered what, in the middle of all chaos. The food is good also, aside from being cheap! Surely one has to try this place when in Madrid. Not a chic one, but ja, I don’t have to be in a fancy restaurant to have a nice good dinner. We love to visit markets wherever we go. And that is also the case here in Madrid. So after browsing at the brochure from the Tourist office, we marked the 2 markets to visit : San Miguel and San Anton. But these two markets are entirely different from what we are used to. Here you can not find so many fresh meat, fish or farm produce being sold, or you can not feel the atmosphere that a local market gives like in La Rochelle or in Bilbao (in our opinion, at least). Mercado de San Anton, on the other hand, is a building with 3 floors. There is a supermarket on the basement; located on the ground floor are some stalls for vegetables, fish, cheese and other herbal shops; first floor are some bars which offer drinks and tapas; second floor are 3 restaurants. Now, the prices of the fish/meat/vegetables here are much more expensive than the normal supermarkets, and I don’t quite understand why some people still do their buying here. Hans and I just sampled a few of the tapas here and then we went through again with our planned walk. Madrid is one shopping paradise. Here you can find exclusive shops/boutiques, big and small. . One can really fill his/her heart’s desire here, from the latest fashion modes, to Bohemian style to everyday clothings. Every street has its specialty : shoes, bags, clothes, jewelries, you name it! It is the trick to find the right shop with the right item and price. And even more, also an art to control oneself not to buy too much, what with an array of items before you! And I should say, I did practice lots of self control of not buying any shoes or clothes. I had to think twice, no, thrice, if I really needed it. And the normal answer was NO. Though I couldn’t help myself buying one souvenir magnets for the ref , just 1 Tshirt and a couple of really nice broches. Hans and I spent lots of time just endlessly walking through the streets of Madrid, from busy Gran Via to quiet somewhat forgotten streets. And everywhere, people seem to be just coming from nowhere; they are present, especially between 17.00- 21.00. We intentionally did not use the metro in going from one big avenue to the other. By walking we were able to see more, discover more of Madrid. It was tiring at the end of the day, but was more fun. Bocadillo de calamares, which is bread with fried squid rings, is one of the Must-to-eat food in Madrid. It can be bought in almost every corner of the city, and is a popular street food. People eat it on the Streets, int he squares, in the park, or just in a quiet area. The price ranges from 3 euro-5 euro, depending on where you buy it. The area around the Plaza Mayor is a good place to grab one. And it tastes good too!